CULVER CITY, Calif. (August 3, 2015) - Sony Pictures Home Entertainment tips its hat for fans one last time with the October 13 Blu-ray(TM) and DVD release of Justified: The Complete Series . The new set debuts just in time for must-have holiday gift lists. Based on Elmore Leonard's short story, "Fire in the Hole," this critically acclaimed FX drama from Sony Pictures Television and Bluebush Productions, stars Timothy Olyphant ("Damages") as U.S. Marshal Raylan Givens, a man who attempts to bring law and order back to Harlan County. Walton Goggins ("Sons of Anarchy") plays Raylan's longtime rival, Boyd Crowder. 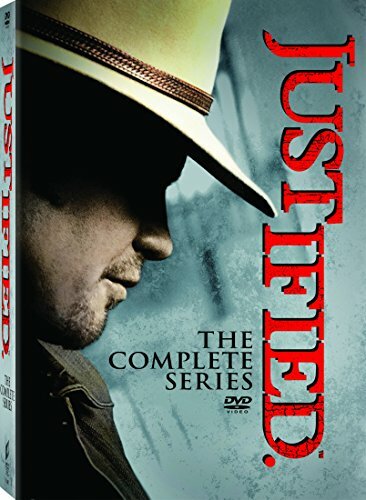 Justified: The Complete Series will include the full 78 episodes with all previously released bonus material. The 19-disc set will contain over 24 hours of special features including a gag reel and three all-new featurettes. "Writers' Room Tour with Graham Yost" follows the creator of Justified as he gives viewers an inside look at what happens inside the writers' room of the show. "Leaving Harlan Alive: Making the Final Season" gives fans a behind the scenes look at Season Six while "Harlan Revisited: Favorite Moments" queries cast members about some of their favorite scenes and memories from the series. Also included in the complete series set will be "In Elmore's Words" featuring actors, who worked with Elmore Leonard, reading select passages from some of his most well-known pieces of work, including "Fire in the Hole," "Three-Ten to Yuma," "Killshot," "Get Shorty" and more. Exclusive to the Limited Edition Blu-ray(TM) set is a Justified flask, collectible packaging and a commemorative disc book highlighting one of the most epic franchises to air on television. Justified: The Complete Series features an extraordinary ensemble cast, which in addition to Olyphant and Goggins, includes Nick Searcy ("Hawaii Five-0"), Jere Burns ("Bates Motel"), Joelle Carter ("Castle"), Jacob Pitts ("Person of Interest"), and Erica Tazel ("The Office"). The series' guest stars have been some of the best, including Natalie Zea ("The Following"), Mike O'Malley ("Glee"), Patton Oswalt ("The Goldbergs"), Emmy(R) winner for his role as Dickie Bennett, Jeremy Davies (2012, Outstanding Guest Actor in a Drama Series) and Emmy(R) winner for her role as Mags Bennett, Margo Martindale (2011, Outstanding Supporting Actress in a Drama Series). For six electrifying seasons, no crime series proved more combustible than the Peabody Award-winning Justified. At the explosive center of the action, Western-style, Stetson-wearing, gun-slinging U.S. Marshal Raylan Givens (Timothy Olyphant) confronts murder, drugs, bank heists, mobsters, crime families, corrupt politicians and even his own tumultuous past - and never backs down. His ultimate adversary is the cunning, complex outlaw Boyd Crowder (Walton Goggins), but the real wild card is Ava Crowder (Joelle Carter), the mysterious woman torn between the two men and both sides of the law. From creator Graham Yost and based on legendary author Elmore Leonard's crime novella "Fire in the Hole," it all leads to a perfectly unexpected final showdown. Sony Pictures Home Entertainment (SPHE) is a Sony Pictures Entertainment (SPE) company. Sony Pictures Entertainment (SPE) is a subsidiary of Sony Entertainment Inc., a subsidiary of Tokyo-based Sony Corporation. SPE's global operations encompass motion picture production, acquisition and distribution; television production, acquisition and distribution; television networks; digital content creation and distribution; operation of studio facilities; and development of new entertainment products, services and technologies.